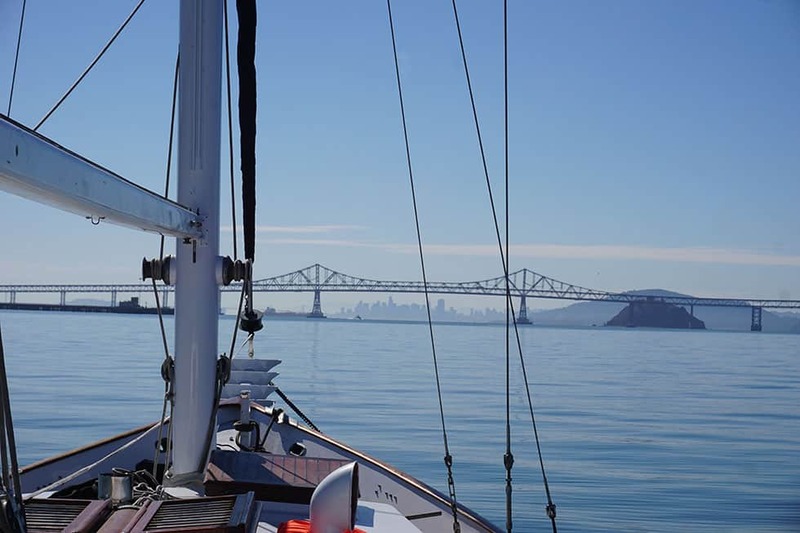 While there are many reasons why I love living on a sailboat, it also has its challenges. It’s not all wine and grapes and sailing into a beautiful sunset. It takes work. It takes dedication. It takes figuring out how to live in an itty bitty space, a complaint other sailors have as well. 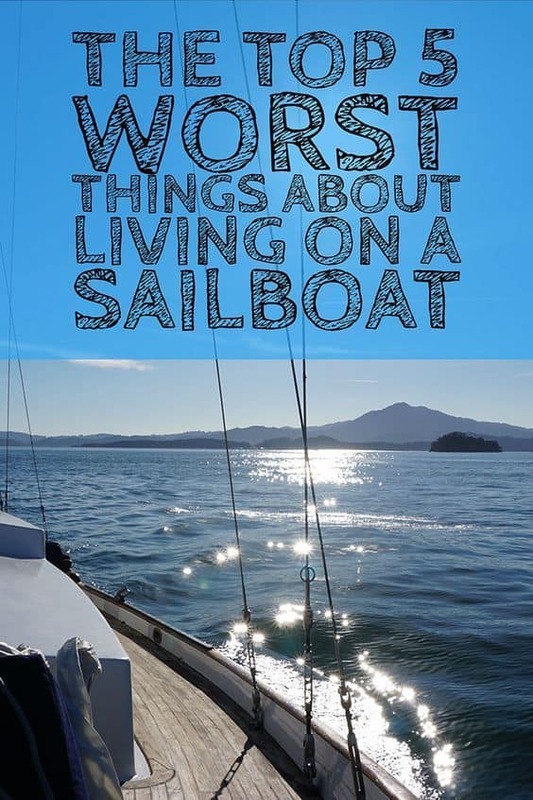 Here are the top 5 worst things about living on a sailboat. If you’re thinking about living on a boat, maybe this will change your mind. At first, I didn’t know what he was talking about. Sell his boat? Why would he ever want to do that? But now, I know. Sailboats take so much work. They’re tedious. They break. It seems like they need endless time, attention, and maintenance. 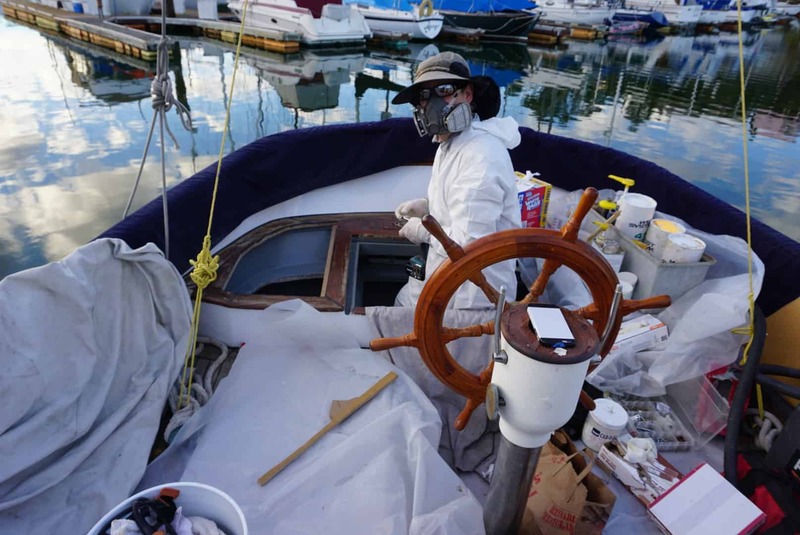 But Tom’s done an amazing job restoring this early 1970’s sailboat, and I’m thankful he’s on board to take care of any mechanical, electrical, rigging, self-steering, toilet, water pump, holding tank, any system that breaks. I’ll stick to the cooking and cleaning and organizing, thank you very much. Although I did learn how to tap a screw. 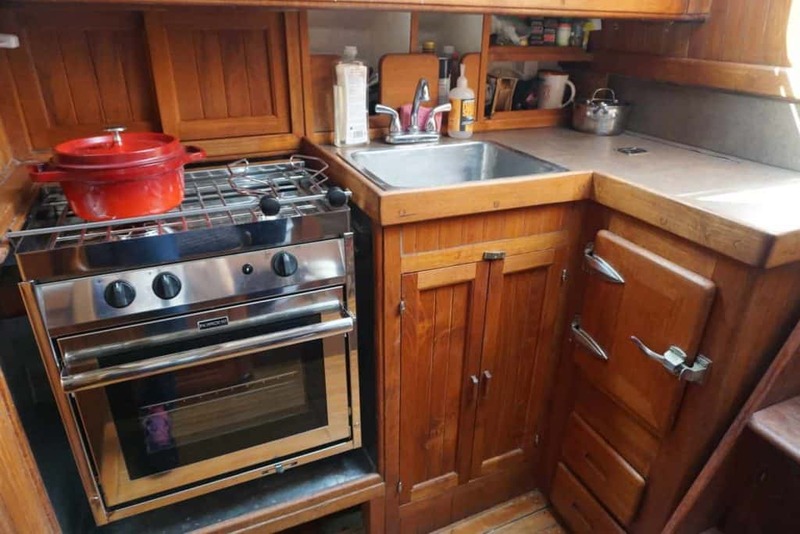 Yes, the kitchen on the boat is super cute and I’m very thankful to have a two-burner propane stove. When we first started living on the sailboat, there was a gaping hole where the stove is now. At first, I cooked on a camping jet-boil stove with a frying pan balanced precariously on top. Then, I upgraded to a plugged-in hot plate. Now, I have a real stove with real flames, and an itty bitty bit of counter space. 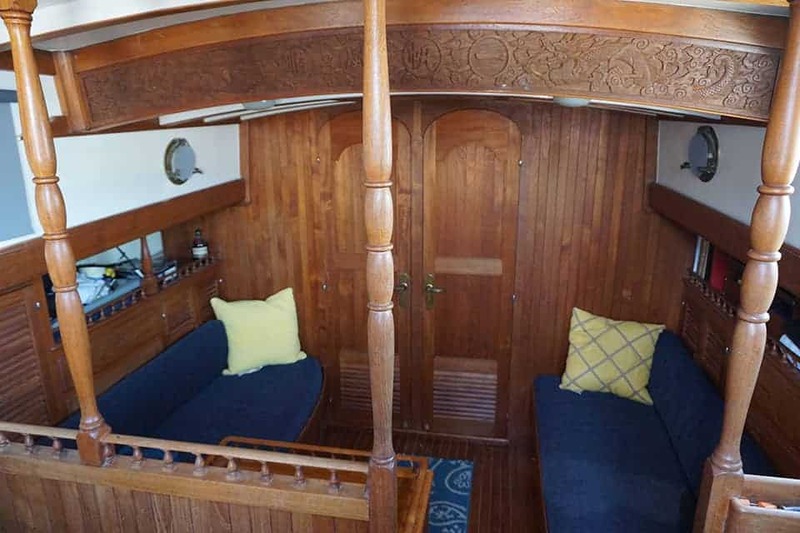 It’s hard cooking in such a small space, and when we sail or are anchored, the gimbaled stove shimmies and sways, and I have to use pot-clamps to keep everything from crashing down on the teak floors. We also don’t have refrigeration…..yet. This means we keep all our cold stuff in a cooler with ice, and sometimes, no cooler at all. I’ve truly learned that most food can sit out for awhile and still be eaten, contrary to the popular uber-paranoid American belief that everything that sits out for thirty minutes goes rancid. I shouldn’t go into how many meals I’ve eaten the next day after they sat out on deck all night in my heroic effort to keep them cool. And I’m still standing. You can read more about what it’s like to live without refrigeration here: I have no refrigeration on my sailboat. Why I’m glad. The boat is 41′ feet, but that doesn’t mean there’s a ton of storage space on it. 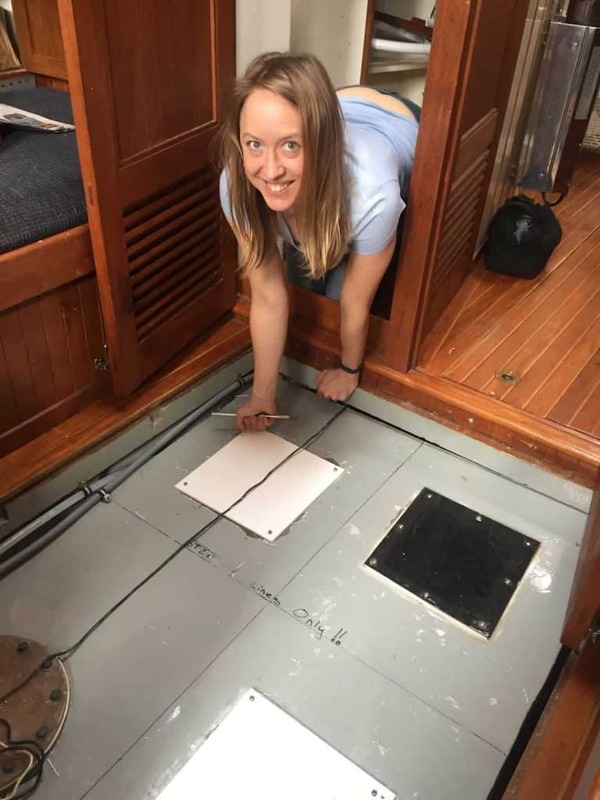 In fact, since the sailboat is undergoing a complete restoration, most of the lockers are crammed with tools of various types. I have a few shelves for food and pots and pans, but the rest goes to Tom’s endless supply of wrenches, hammers, electrician’s tape, rubber gloves, masks, white chemical suits, and God knows what else. This means I have one tiny locker above the bed for a select number of clothes, and the rest is crammed into my trunk. Yup, my trunk is my measly closet while living on the boat. My nice clothes are crammed into one suitcase, my workout clothes into another, and shoes and laundry into large Ikea bags. It’s hard to look respectable when rummaging though my trunk looking for that day’s outfit. I’m sure this will change when we go on longer cruises. Tom will (finally!) put his tools away, and I’ll get a little more space. Another thing about living in a really small space is that you have to REALLY like and get along well with your partner. 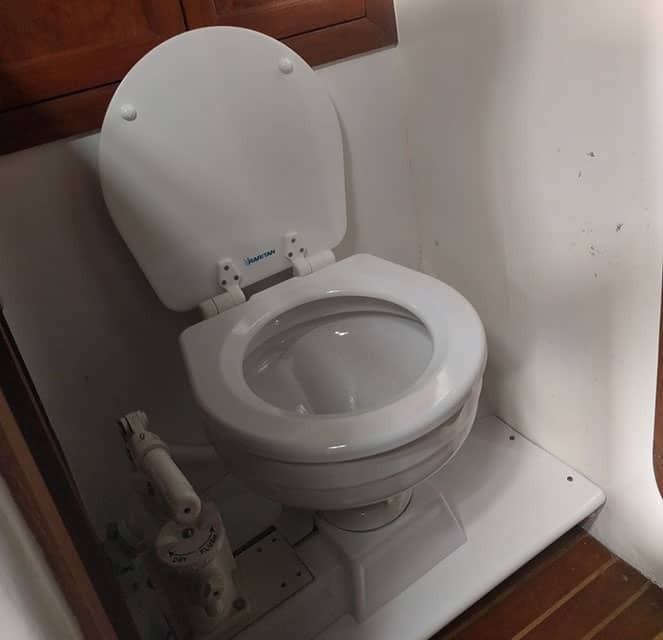 So, as with the stove in the kitchen, I’m very, very thankful to have this toilet on the boat. It’s a brand new Raritan toilet that works like a charm, except it sounds like a heaving sea lion when I use that little pump handle thingy. Tom built this to not smell whatsoever, and so far, so good. 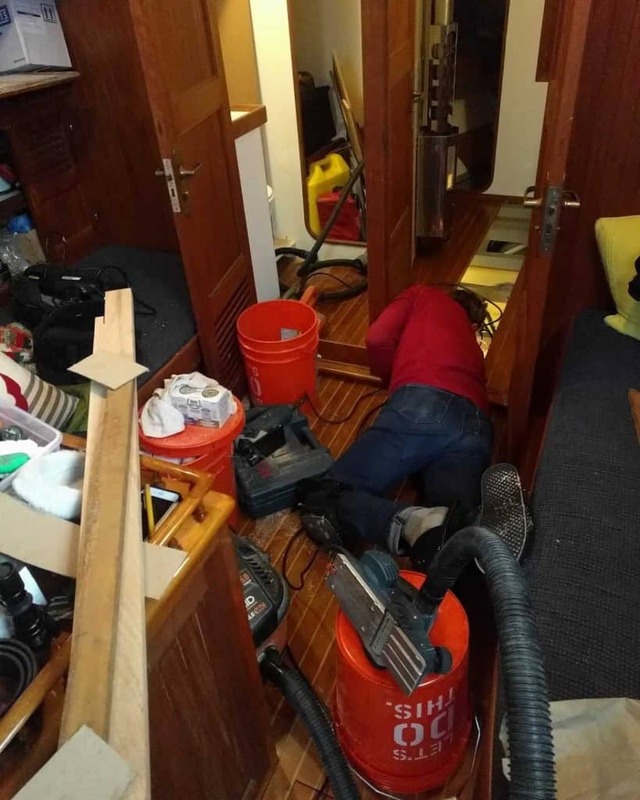 The only really gross thing is that when you’re living on a sailboat in a marina, you have to visit the pump-out station and use the little poo-poo vacuum cleaner. The nozzle attaches to a small hole on deck, and it charmingly has a little clear area where you can see liquidy brown goo being pumped out. This isn’t my favorite task in the world. I sit there, pushing the nozzle down, watching everything that went out…come up. Enough said. Ew. If you’re prone to seasickness, living on a boat is probably not that great of an idea. When we’re docked at the marina, the boat doesn’t really move at all, but she can bounce around quite a bit in boat wakes and currents when anchored. Luckily, I’ve been able to handle the movement for the most part, except for the one time we’ve been out in the ocean. We passed under the Golden Gate Bridge and everything changed. The small swells turned into long, rolling ones four to five feet high. When we were going into it nose first, I enjoyed the movement, but coming back, we were hit from the back, from the side, over and over again. My stomach balled into a knot and I had to concentrate on breathing and staring at the horizon. I’ve heard even the most experienced sailors get seasick, and I’m looking into ways to cut down on the nausea when out on the open waters. If you have any tips, that’s much appreciated! I don’t think living on a sailboat is for everyone, but I’m able to deal with the downsides. For me, the good outweighs the bad. I love the idea of being able to move my home around to explore distant ports, or just to change my backyard on a weeknight. 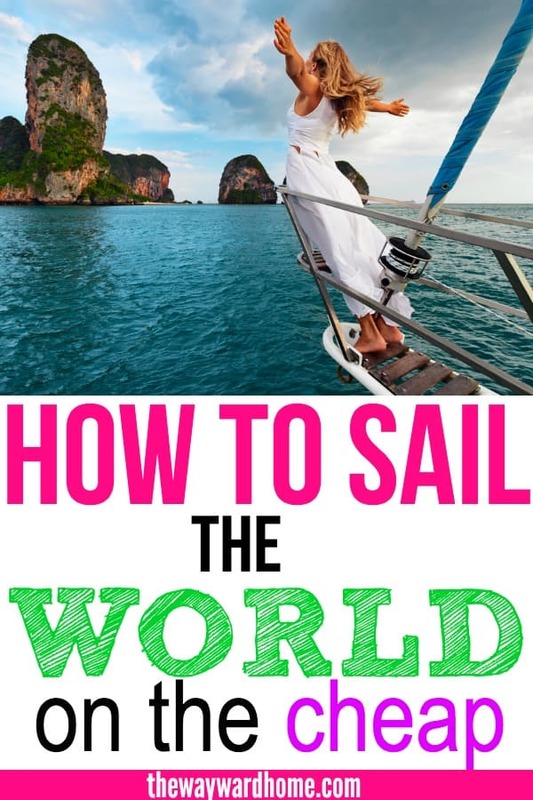 Click here to read 5 Reasons Why I Love Living on a Sailboat. QUESTION: Do you think you could live on a sailboat? And if you already live on one, what are the hardest things for you to deal with? I live on the great lakes in a 37′ sailboat all year in the water. Might not be for everyone but taking it away from me would surely kill me. I would never go over 38′, just my personal preference for single handing the boat. Which is even smaller but I wouldn’t have it any other way. Wow, on the Great Lakes? Does it get super freezing in winter? Calling the liveaboard a liar is not honourable or polite…Holy Christ! Try scopoderm patches for sea sickness, they have to be prescribed in the UK, not sure in the USA. They work like a charm on my OH and you can use them either before hand to prevent or when motion sickness comes on. Apparently fresh ginger is really good. Mash it up and add sugar to it. The seasickness would do me in. 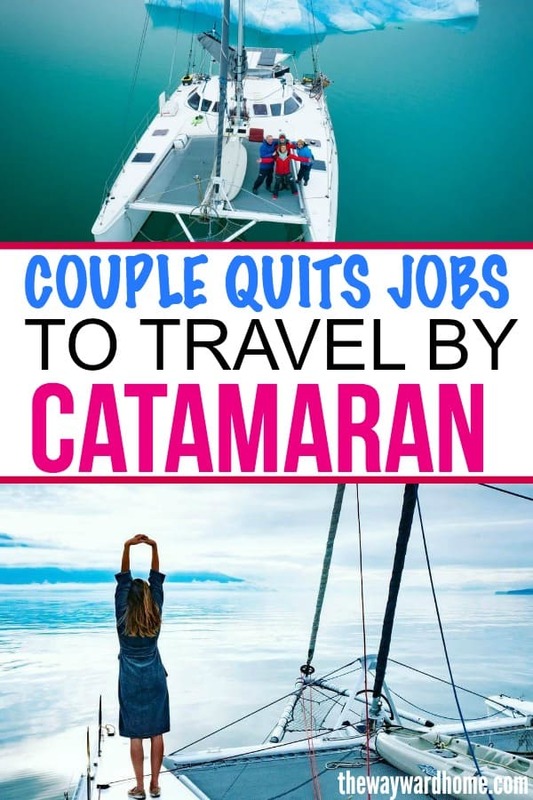 I think the parallels of mobility and minimalism between VanLife and SailingLife put us in similar situations, but I’m sure glad to be able get out of the van and see mountains and lakes, rather than being constantly hurtled around by water. 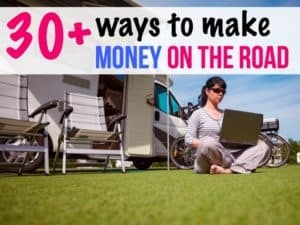 I am also really tempted by VanLife because I SO love the mountains! We were just in Yosemite and that plays just slays me with its beauty. But then we came home to the boat and I was also so in love with the sea air. I just don’t want to travel places that take me away from the mountains for very long! Wow, 41 feet! So jealous! That would allow me to finally get a bicycle. I live on a 34 foot Pacific Seacraft with my husband and golden retriever. It’s not terrible but it is challenging to be captain all the time. I’m the leading partner on our boat and my husband has found the learning curve quite steep. I find it exciting to be a 51 year old beginner. But he just finds it stressful. BTW, very thankful to have gotten rid of the pump outs. Installing a composting head was the smartest thing we ever did. Oh interesting! 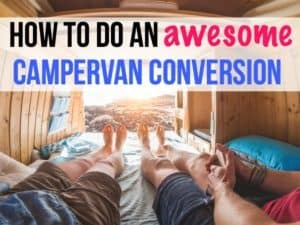 I know a lot of people do that in vans. Yeah the learning curve of sailing is hard for me, too. My boyfriend is the experienced one, but I am trying! That’s so interesting to use a composting toilet. Luckily, our boat doesn’t smell at all, just the pumpout station is a bit gross, haah! 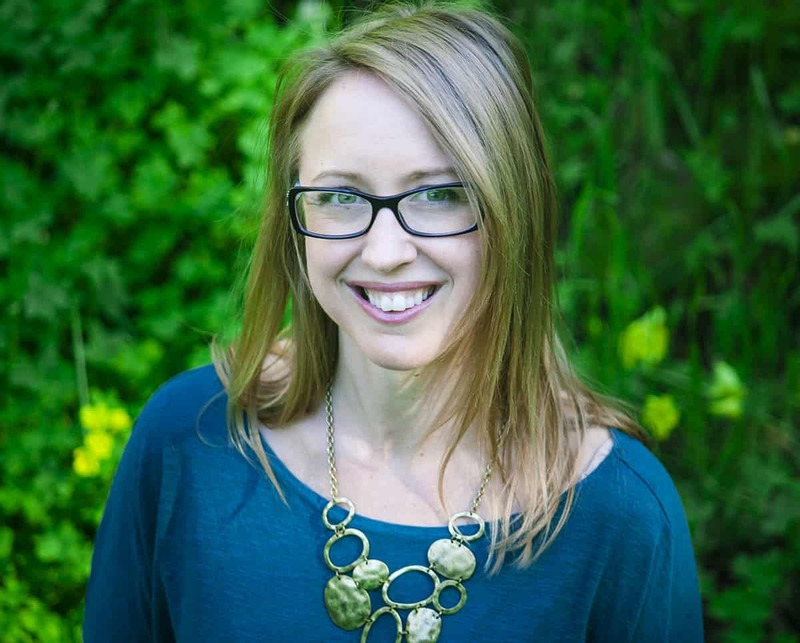 My husband and I live on a 42′ power boat in the summers in Chicago — I agree that pumping out and not having a “real kitchen” are hard to live with (props to you for living without refrigeration– we couldn’t do it!). I’d also add that we don’t use it as a boat when it’s our home (it sounds like you still do, which is awesome), we have loud neighbors (we live on a “party” dock), and having my stuff scattered among the boat, a storage unit, my parents’ basement, and my husband’s house makes me feel like I’m going positively mad when I can’t find something! I am so thankful we’re at a dock, at least for now. We have a couple huge water tanks so only have to fill every couple weeks or so. But yeah, having the hose is essential! Where are you guys located? I lived on a 31 John Alden on Nantucket for a year- cheaper than any rent out there. Loved it. It does freeze in winter, so I emptied the water tank and lines. I worked on land and didn’t want to have the boat heated all day while empty. So I just carried a jug of water home every night. The Wallas diesel stove kept it super toasty warm when I was on the boat (and dry!). No problem! I LOVE heating the boat in winter, it’s so cozy! We use a kerosene heater, which is lovely. I’m almost excited for cooler temperatures and rain. My partner and I are in the process of looking for a sailing yacht in the UK. We’re both done with pumping our hard earned money into the system to pay for some bosses Superyacht! A great tip to help prevent sea-sickness is to substitute your morning coffee with a cup of ginger tea or munch on a couple of ginger biscuits throughout the day. Basically, anything with ginger in it will help keep that nausea feeling at bay. Thank you Alexandra! I’ve also heard the tip of eating green apples or sucking on a green apple jolly rancher…strange huh! I will try all these remedies soon. I have a 43 foot boat that was built in the late 1970’s. The work involved is just as you have described but I would rather be on the boat, slaving away than relaxing at home after a hard day at the office. There is nothing more gratifying. Green apples work really well!!! I enjoyed reading this article and feel for you with the seasickness; not nice at all. Have you been out again to try some of the suggestions? I know a friend of ours uses the Sea Wrist Bands and they do the trick for her; even for flying in airplanes; take-offs and landings and driving in cars as she also gets car sick – perhaps the wrist bands are similar to scopoderm patches but yes, I have heard great things about ginger as well. I love the teak on your boat – simply beautiful. 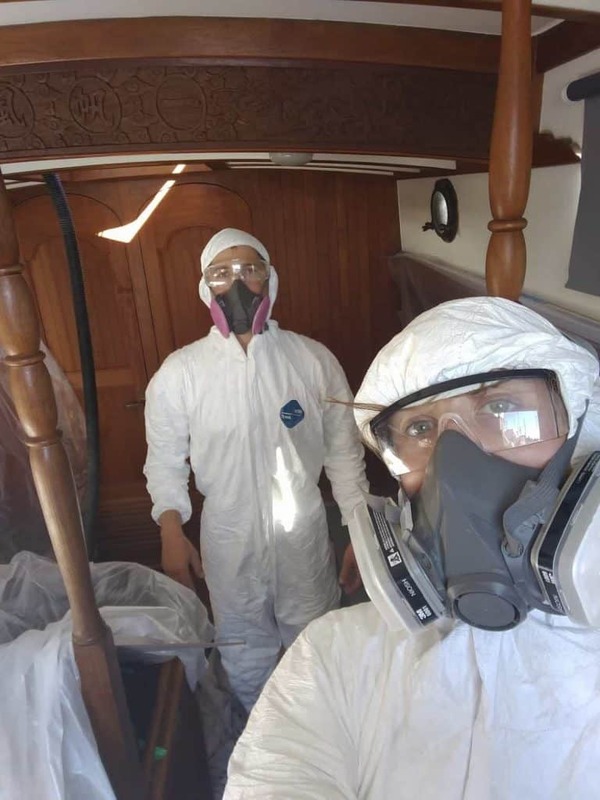 They do not make them like that anymore; mostly white and fibreglass – boring – do not have the same character and yeah, I know what you mean with the boat being cosy in the cooler climate; our boat was warmer this past weekend at night then our home. Oh, and wow – no fridge – that would be huge for us but goodonya for embracing that. I will check out your other article about that. Question about your stove – so, it comes with a small oven, too? What model is it? 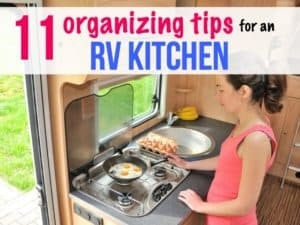 We have a fridge but no oven and we have not done any long distance sailing yet – longest stretch since Oct 2017 was 2 weeks and we are considering cruising longer term, but I think I will miss an oven for the occasional baked treat, but I also noted your post about the pressure cooker that is one of the 13 things you would not do without. Hope you get the fridge soon and some proper storage, too and that your seasickness goes away or you are able to control successfully. Hello! 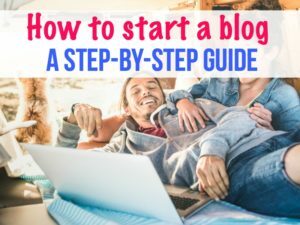 Thanks so much for writing! So, that stove is a Force 10 stove and is just amazing…..I bake things in it all the time! It fits a standard size baking dish or a large cast iron pot where I bake things. And after two years of no refrigeration….we are now getting it! The new refrigerator will arrive this month…crazy. But I’m glad we learned to live without. And yes, the pressure cooker is really awesome – my favorite thing. Happy cruising to you and thanks for reading!